Celebrate World Nutella Day with Our Delicious Crepes! Home Crepe Blog World Nutella Day! Sunday February 5th is World Nutella Day, and we are super excited! The famous chocolatey hazelnut spread is a favourite to include in our dessert crepes. 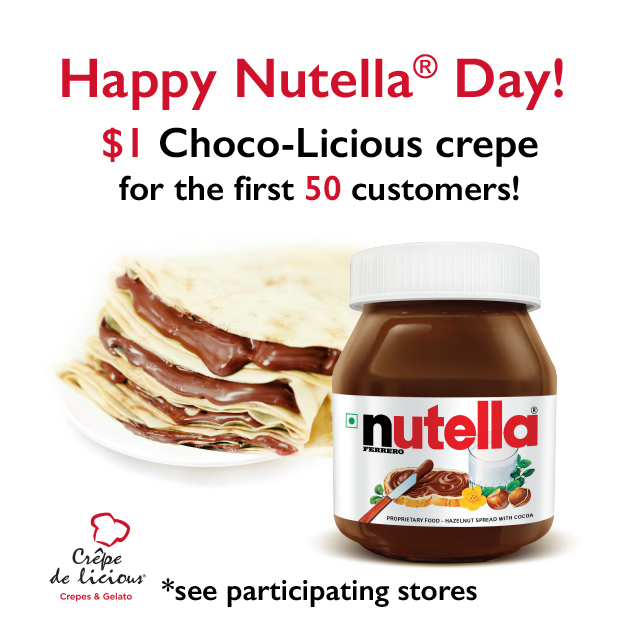 Crepe Delicious will be offering $1 dollar Choco-Licious crepes for the first 50 customers in honour of this day! Stop by one of our locations and share your passion for Nutella with us! Metrotown at Metropolis, Burnaby, B.C. Willowbrook Shopping Centre, Langeley, B.C.